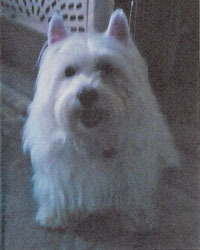 Wrigley came into rescue in 2009 at the age of 7. His owner had to surrender him due to his allergies and no longer being able to afford his medical care. After coming into rescue he became part of the Atopica study. After being on the medication for about 2 months his hair around his arms, neck and tail started to grow back. His foster mom became so attached to his loving and goofy self that she adopted him. Wrigley joined a pack of westies and also a scottie sister. He loved to go for walks and absolutely loved the dog park. Take his leash off and turn around he’s gone greeting eveyone and everything. 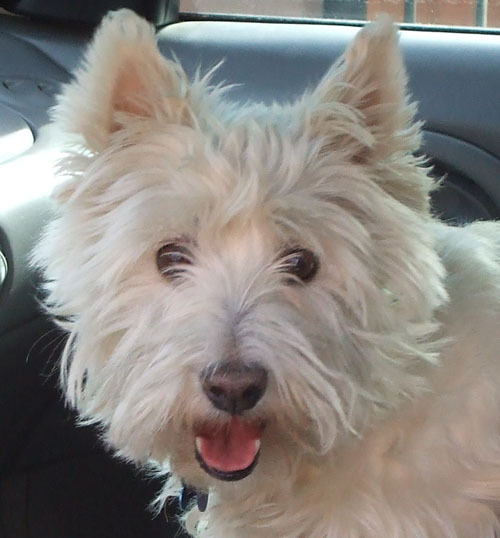 Wrigley loved his family with all his heart. When you’d walk through the door after a long day he would roo, army crawl and bark cause he was so happy to see you. Sometimes he would grab a toy and run around to get your attention. He acted like a puppy with toys. Wrigley loved to cuddle right up next to you no matter if it was the couch, chair or bed. He snores just like a human. 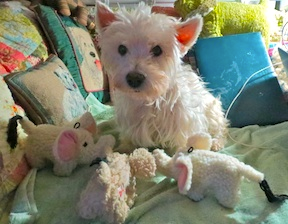 He loved his westie brothers and scottie sister. He was great with fosters coming into rescue. Wrigley was the most amazing and fun filled dog his family could ask for. In 2014 he was diagnosed with bladder cancer. His appetite changed, he didn’t want to go for his walks, and he couldn’t control his bladder his family knew it was time to take him to the bridge. After having Wrigley for 5 years and battling cancer for about 6 months his family made the heartbreaking decision on September 2nd 2014 to put him to sleep. Wrigley your family loves you and will miss you. Go run with your brothers and sisters at the bridge. 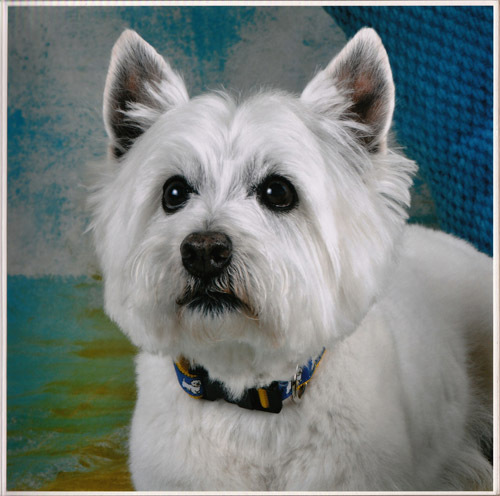 My beloved Liberty passed over to the Rainbow Bridge on March 5, 2014 at the age of ten. I got him as a puppy and he went to obedience classes. 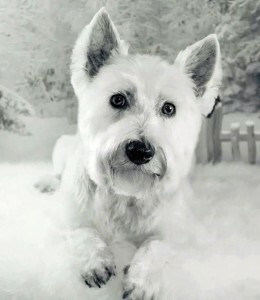 He was a male westie born on October 10, 2003. I had to wait for him to be born and saw him for the first time when he was six weeks old and couldn’t take him home until he was nine weeks old. He was the most loving and smart dog. He was by my side and gave me unconditional love his whole life. I took him with me to my grandchildren’s sports activities and everybody loved him. He loved people and they loved him. He would greet people and roll over for a belly rub. I had him cremated and they made a print of his paw in clay. When I die, he will be buried with me. I called him God’s creature. 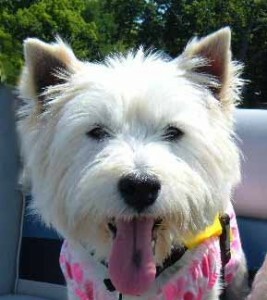 I dearly love the Westie breeed. A Dog’s Will and Testament written by an unknown author says to go find an unloved dog and give my place to him. 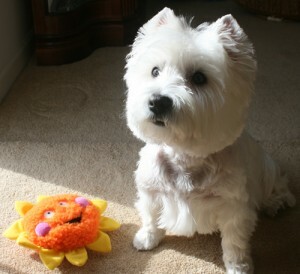 So I want to Rescue a Westie and give my love and a good home. I have such a great love for animals. Mia arrived into Rescue as a stray. She had been abandoned on a country road and appeared to have been a breeding dog. She was in rough shape but with medical care, she regained her health. 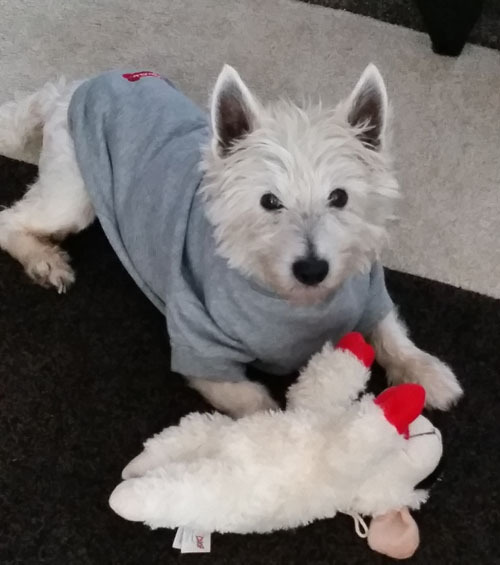 Her new mom adopted despite knowing that she had had surgery for mammary cancer and very possibly had Westie Lung disease. 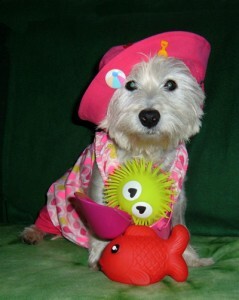 We are sure that Mia had two wonderful years before she passed, and are sure they were the best years of her life. 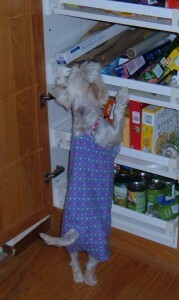 She was a lovely little girl and we were blessed to have had her in our homes as a foster dog. Sadie passed unexpectedly. We are grateful to her foster home for giving her a haven and helping her to grow so much during those last few weeks of her life. 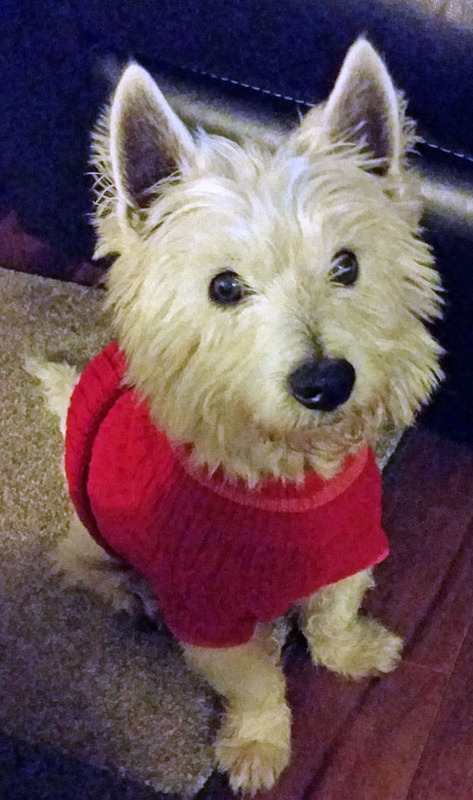 It is with much sadness and heartbreak that I write today to say our Wesley went to the bridge yesterday. He was diagnosed with Osteosarcoma of the mouth 10 days before we came down to Hilton Head. We decided we could not put him through the invasive surgery and that we would let him live out his days as enjoying the things he loved to do. So we brought him down to Hilton Head which he has learned to love the last few years. He ran the beach, walked the trails, played with furry friends he made down here and got lots of attention and pets from all who met him. His days were happy and filled with love. But, the last few days the Osteosarcoma took over his mouth and he could no longer be pain free or live a happy life. We loved him too much to let him suffer. Wesley will always be in our hearts and we are so happy we got to rescue him 9 years ago (He would have been 15 this July 4th). He brought us and his brother Watson so much love and joy. We miss him so much, Little Watson keeps looking for him. I know he is running. and playing big ball at the bridge and he was greeted by all his friends he loved who are there too. Wesley playing “big ball” with his brother. 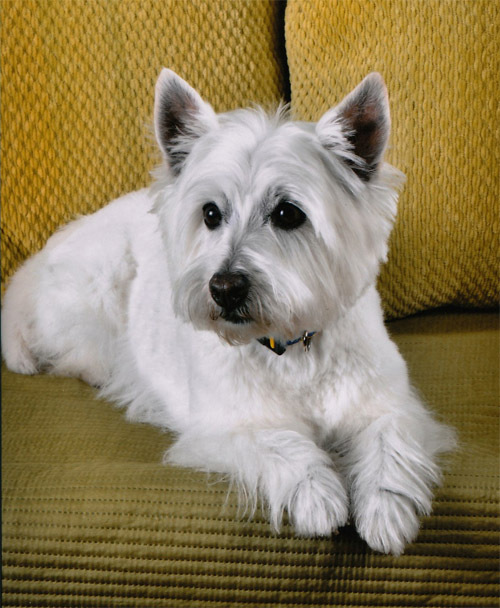 The perfect blend of the many wonderful Westie characteristics with another handful of each thrown in for good measure — that was Mandy. She came into our lives at 10 weeks and left us at 10 years of age. 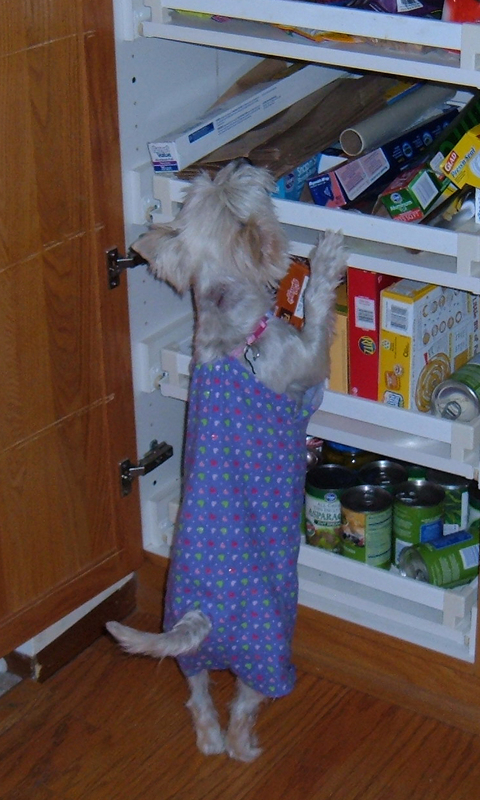 As a little puppy, she ran like the wind in her fenced back yard. And once she learned that chipmunks and squirrels resided in her territory, all was right in her world. She loved her walks and was especially happy to see children playing along the way. At that point she would come to a complete standstill and observe them in total fascination. She was a part of everything that occurred in our lives and truly loved being in the midst of it all. Through the last 7 years of her life, she was treated for diabetes which was surprisingly diagnosed just prior to her 3rd birthday. And she was such a trooper by enduring those twice daily injections. When we told her that it was time for her shot, she would actually lead us to one of two specific household locations of her choice and position herself to receive the injection ever so willingly. And then in July of 2011, an innocent, routine, six-month wellness check-up led us to x-rays, ultrasounds, spleen surgery, and the dreaded pathology report — hemangiosarcoma. It was all so unexpected as well as totally devastating. She left us far too early, but we feel privileged to have shared ten wonderful years with Mandy and to have been the people that she loved morning, noon, and night. Every single day she brought us sunshine and moonbeams, and life just doesn’t get any better than that. Needless to say, we dearly miss our sweet Mandy. Late yesterday afternoon I took a wondrous journey. I wasn’t doing well most of the week and my Mom and Dad told me I would be seeing my brother, Jerry, very soon. My physical self was not accepting of food and water, was very weak and sleeping was all it seemed to do. 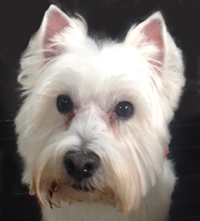 My spirits were low, but Mom talked about crossing the Rainbow bridge and how my body would-be healed. 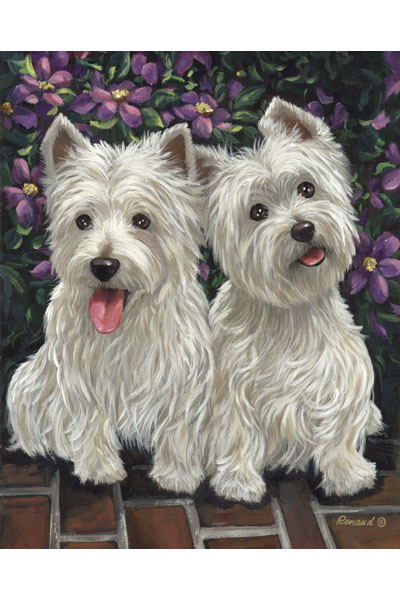 She said Jerry and all the Westies that had lived here would greet me on the other side. All pets waiting for their masters and mistresses would be there too. …. When I first came to this home when I was 9 years old, I was given costumes to wear and eventually had a wide wardrobe. 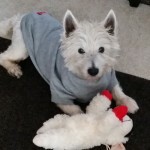 Being a Scottish lass, I had a kilt that I wore in our annual Parade of Rescues and a special plaid cotton frock for when I represented rescued Westies at our local Scottish games. For our last trip to the vets office, Mom let me wear my special pastel collar that was to be for Easter this year. …… Everyone in the office came to say goodbye and while I did not appreciate the shot to my derriere, my body relaxed and I was soon drifting off. Mom and Dad’s voices were calming and I could hear the tears held back so I would not worry about them,……The journey was quick and Jerry was there for me. He said had not expected me yet as he had come here just a year and two days ago, but was happy to see me……….Well, thanks for reading my little note….. Remember, that putting your beloved pet to sleep is the hardest part of having a pet. Being put to sleep is the best wording for that last time at the vets.